This pre-Labor Day weekend week is looking like a fairly quiet one in New York politics, though there are a few things to watch for. Mayor Bill de Blasio is due to return Sunday evening from a vacation week traveling throughout New England with his family and could have an active week. The mayor starts the week with one public event on his schedule: he'll be in Queens Monday evening to deliver remarks at the opening ceremony for the 2016 U.S. Open. One certainty for the week ahead is that much attention will be turning to the fist of three scheduled legislative hearings on water quality and the Cuomo administration's response to water quality problems in Hoosick Falls and elsewhere - the initial hearing is Tuesday in Hoosick Falls. That first hearing on "drinking water contamination" is being held by two state Senate committees. The other two hearings scheduled - on September 7 in Albany and September 12 on Long Island - will be joint hearings of the Senate and Assembly. Neither Gov. Andrew Cuomo nor city Comptroller Scott Stringer nor Public Advocate Letitia James has any public events scheduled for Monday. City Council Speaker Melissa Mark-Viverito did not release a public schedule as of Monday morning at 8 a.m.
At noon on Monday, Lieutenant Governor Hochul will address students and faculty about Governor Cuomo’s Enough is Enough initiative to combat sexual assault on college campuses, at SUNY Geneseo. At 1:15 p.m., Hochul will highlight state investment in state parks at Letchworth State Park Nature Center. 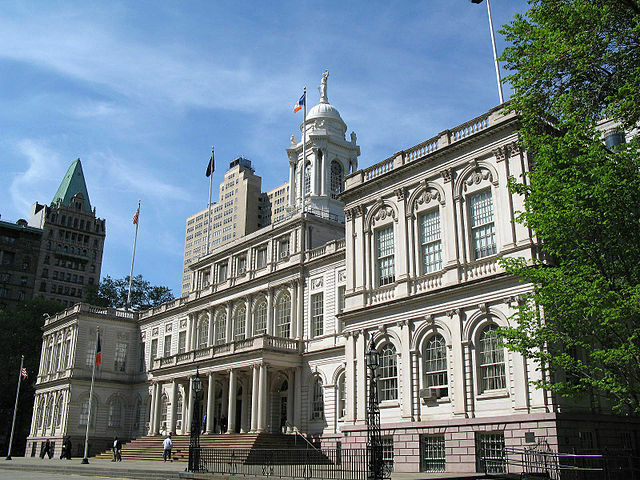 The City Council is silent this week in terms of hearings, returning to action after the Labor Day weekend. On Monday evening on NY1's Inside City Hall there will be a debate between the two candidates in the Democratic primary for the 10th state Senate district in Queens: incumbent Senator James Sanders and challenger Adrienne Adams. At 8:30 a.m. on Tuesday, the New York City Food Policy Center is hosting its Food Policy For Breakfast Series with Naomi Starkman, the founder and editor-in-chief of Civil Eats who will discuss food policy with executive director of the Food Policy Center, Charles Platkin. On Tuesday at 11 a.m., "State Senator James Sanders Jr. will host a press conference...at the Sutphin Boulevard / Archer Avenue train station to announce that $7.65 million in state funding has been allocated for improvements to the Jamaica Transportation Center Station Plaza. This money was set aside in the 2016 budget for a multi-year state transportation plan agreed upon by Senator Sanders along with his colleagues in the legislature and Governor Cuomo." "On Tuesday, Mayor de Blasio will host a roundtable discussion regarding tenant protections...After the roundtable, [at 12:30 p.m.] the Mayor will host a press conference to make an announcement regarding legal representation for tenants in housing court." On Tuesday evening, NY1's Inside City Hall will host a debate between incumbent Bronx State Senator Gustavo Rivera and his Democratic primary challenger City Council Member Fernando Cabrera (Cabrera also challenged Rivera in 2014). Read our latest coverage of this race. NY1's Inside City Hall will host a debate between incumbent Brooklyn Assembly Member Pamela Harris and her Democratic primary challenger Kate Cucco. On Thursday evening, at 6:30 p.m. at the Sikh Cultural Society in Queens, "Deputy Mayor for Strategic Policy Initiatives Richard Buery will lead a panel discussion on ThriveNYC, the City’s mental health roadmap for all. He will be joined by Vishavjit Singh, creator of Sikh Captain America and Sikhtoons; Dr. Muninder Kaur Ahluwalia, an associate professor at Montclair State University; and Arvind Kaur, clinical psychologist and host of Jus Galbaat. This event is organized by Mayor Bill de Blasio’s Community Affairs Unit and Office for Immigrant Affairs, in conjunction with the Sikh Cultural Society and United Sikhs." Earlier this week Assembly Speaker Carl Heastie announced that the Assembly will hold public hearings on water quality in early September. The hearings are considered a long-overdue victory for environmental advocates and victims of water contamination emergencies across the state, such as in Suffolk County, Petersburgh, Newburgh, and most notably, in the village of Hoosick Falls. It was also seen as a potentially embarrassing development for Gov. 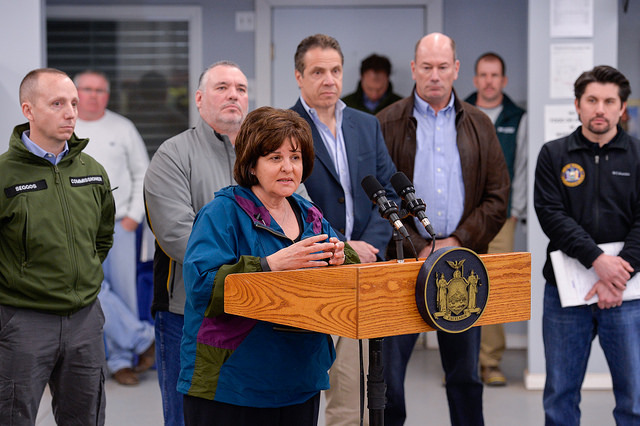 Andrew Cuomo’s administration, which has fought off the perception that it failed to act quickly enough to address contamination in Hoosick Falls. On Friday afternoon Senate Republicans announced they will also hold hearings into water contamination in Hoosick Falls. Senate Majority Leader John Flanagan wrote in a statement that the "New York State Senate will hold public hearings in an effort to explore the sources of water contamination, examine state and federal oversight issues, and determine how we can prevent this from happening in the future. The first of those hearings will take place in Hoosick Falls. It goes without saying that we welcome the opportunity to partner with the Assembly to maximize the focus on this important issue." Shortly after the Assembly hearings were announced this week, Politico NY reported that a congressional oversight committee has sought records from the Cuomo administration detailing its response to the water crisis in Hoosick Falls. Meanwhile, major New York electeds such as Democratic Sens. Chuck Schumer and Kirsten Gillibrand and Republican Rep. Chris Gibson have called for hearings on the federal level. Gillibrand met with Hoosick Falls residents on Friday for a roundtable on PFOA, the chemical that has contaminated the drinking water there. 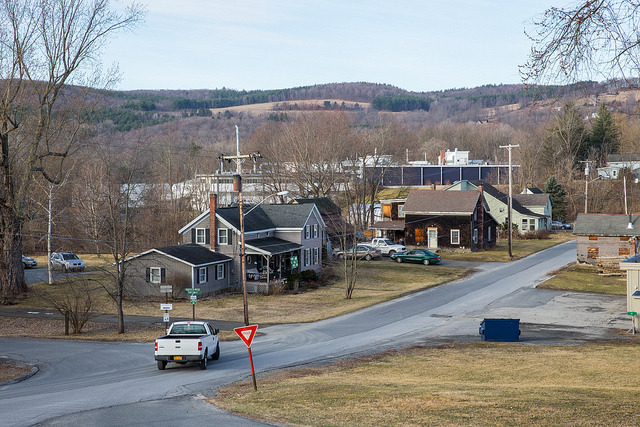 Hoosick Falls, a small village of 4,000 people in Rensselaer County, has been crippled by a water contamination crisis lasting almost two years to date. Concerns about the village’s water supply arose in 2014. Resident Michael Hickey asked to have the village’s water supply tested as early as August of 2014 for the manufacturing chemical perfluorooctanoic acid (PFOA), after his father died of kidney cancer. In November, water sampling results indicated PFOA levels of 180 parts per trillion to 540 parts per trillion; far greater than a provisional health advisory established by the Environmental Protection Agency (EPA) in 2009 of 400 parts per trillion, according to Hoosick Falls’ website. Yet, the EPA did not issue an official warning to the village against drinking the water until one year later, at the end of November 2015. The Cuomo administration delayed even longer, failing to classify PFOA as a hazardous substance and unlock State Superfund Site dollars to address the contamination until late January of this year. The governor pointed the finger at federal authorities and has said he doesn't think there is anything else the state could have done - a response that has intensified the calls for public legislative hearings. In February, a bipartisan group of Assembly members announced that hearings on the Hoosick Falls water crisis would be held in April to examine the causes of water contamination issues statewide, as well as the government’s slow response to them. As April approached, however, support for the hearings essentially vanished. This sudden elimination of support may have been a product of private budget negotiations between the governor, the Assembly speaker, and the Senate majority leader, according to Politico NY. On May 19, the EPA announced a new lifetime health advisory for PFOA, set at 70 parts per trillion. With the new advisory level, several other localities and communities across the country also suddenly found themselves with toxic drinking water, though the EPA still considers PFOA an unregulated chemical. This makes the advisory non-enforceable, and government response far from guaranteed. Before the Senate committed to holding hearings, Baker also echoed this sentiment, saying, “No one knows, except Senator Kathy Marchione and Senate Leader John Flanagan, why they will not call for Senate hearings. It's unfortunate, but I think everything else has fallen into place under public pressure." Senator Marchione’s office did not respond to Gotham Gazette’s request for comment. Perhaps in response to this "public pressure" the Senate finally stepped in on July 8, when Majority Leader Flanagan announced they would also be holding hearings, the first of which will take place in Hoosick Falls. The hearings are scheduled in August, prior to the Assembly's September hearings, most likely to make up for the Senate's delayed response to address residents' concerns. Senate Republicans enjoy a close relationship with Cuomo and many believe they had been working to shield the Governor from potentially embarrassing hearings. While the August and September hearings appear to be focused on the prevention of future water contamination issues in the state, the federal government is also initiating a probe into the response of the EPA and state and county health departments to the Hoosick Falls contamination issue. According to the Times Union, the U.S. House Committee on Oversight and Government Reform sent letters to both Cuomo and the EPA on Wednesday, calling for information about their responses to the crisis. According to ABC News, the Committee wrote to Cuomo that it will be “looking into whether residents received misleading information that indicated the water posed no health risks, which exacerbated the crisis." Note: this article has been updated with news of the Senate hearings. Just imagine knowing that the water you are drinking is quietly making you sick. That it gave you or someone you love kidney cancer. That it took years to get your government to listen, then when you got its attention, your concerns were downplayed. The bond between clean water and our health has been broken as we’ve heard stories state- and nation-wide about contamination. And like Flint, Michigan, there is a great disconnect between the suffering of Hoosick Falls, New York residents and the actions (or in this case, inaction) of their own elected officials. Hoosick Falls residents are just 30 miles from the steps of the state Capitol in Albany, but that may as well be a million miles given the response from the people elected and hired to protect them. Hoosick Falls residents deserve to know what happened, and who knew what and when. Further, lawmakers cannot ignore that what has happened in Hoosick Falls is not limited to just that village. Grossly inadequate chemical regulations on the books in New York, coupled with an increased hunger by state Senators to “cut the red tape” (which translates into cutting resources and powers for enforcement of our laws) means that it is only a matter of time before another community is fighting another unregulated chemical which has fouled their water. 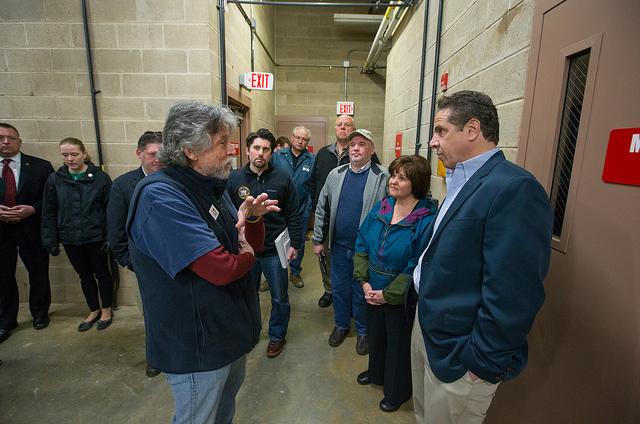 Hoosick Falls is like many New York communities, particularly upstate, with an extensive manufacturing history. For decades, industries were allowed to operate virtually unchecked as their operations endangered residents. For many years, contaminations of this kind were seen as affecting other communities home to larger companies. General Electric, for instance, spent decades dumping PCBs into the Hudson River, up until the late 1970s. Meanwhile, outside Syracuse, Onondaga Lake became known as the most polluted lake in America after a century of pollution from predecessors of the very same company associated with Hoosick Falls contamination: Honeywell. A lack of regulations and enforcement created a false sense of security for many communities – after all, if a chemical isn’t regulated, it’s not tested. And if it’s not tested, then how does anyone know if it’s in their water and affecting their health? In May, when the federal Environmental Protection Agency (EPA) issued new safety levels for PFOA and PFOS, many localities suddenly found themselves with unsafe drinking water. Of course, the water had been unsafe for many years – but if no one knew to test for it no one knew there was a problem. Since the crisis in Hoosick Falls became public, PFOA has been found in the drinking water of nearby Petersburgh, a community also now home to a Superfund site. PFOS has also been found in the City of Newburgh’s water; water in Suffolk County also exceeds safety levels. Which brings us to the realities of today, and the unique role that state legislators have in holding hearings - public reckonings that help clarify what can and should be done to help people. Currently, there are more than 80,000 untested and unregulated chemicals on the market. The state Department of Environmental Conservation (DEC) has introduced emergency rules regulating PFOA and PFOS, but there are still tens of thousands of chemicals unaccounted for. Resistance to legislative hearings is a head-scratcher. We’re pleased to hear that the Assembly has reopened the door to hearings; they should have occurred as originally planned following passage of the 2016-17 budget, which occurred April 1. This summer is now the time to follow through - no further delay is acceptable. These hearings should not be scuttled, the issues facing the people of Hoosick Falls and other municipalities must be seen in the light of day. It is legislators’ responsibility. Hearings are a part of governmental checks and balances. Witness how rapidly the Senate rushed to hold a hearing on how to keep communities from imposing a fee to curb costly plastic bag waste. A public health crisis certainly deserves more proactivity than we have seen. Instead, the Senate is advancing a package of bills toward a vote that would exacerbate the very problems resulting from poor oversight and enforcement. In fact, one proposal forces agencies to enact a “one-in, one-out” practice when imposing new rules. In other words, when the DEC finalizes its PFOA rule, they would have to cut a regulation for the benefit of Honeywell International and Saint-Gobain, the companies responsible for the Hoosick Falls contamination. The action that legislators take now will have enormous consequences for years to come. They must use their expertise in local affairs toward addressing their constituent concerns and public health hazards. The goal should be to consider contamination issues from across the state to connect the dots and create a game plan that modernizes our regulations and enforces our laws. 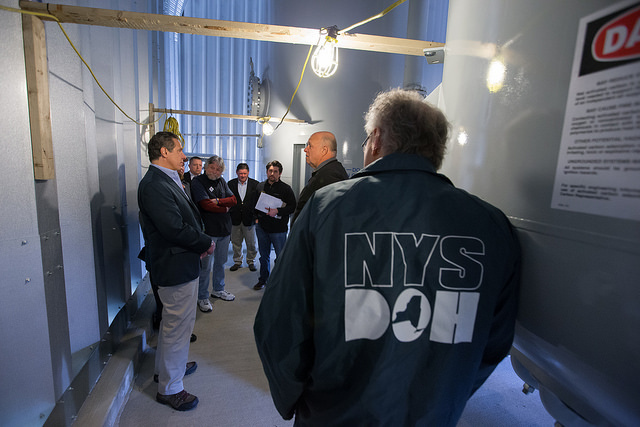 New Yorkers must have confidence in both their drinking water and their elected officials. Residents of Hoosick Falls and many other locales would be glad to hear that their elected officials are working throughout the summer to protect our water and our health. It’s an opportunity lawmakers should not pass up. By Liz Moran, Water & Natural Resources Associate, Environmental Advocates of New York. On Twitter @greenwatchdogNY.